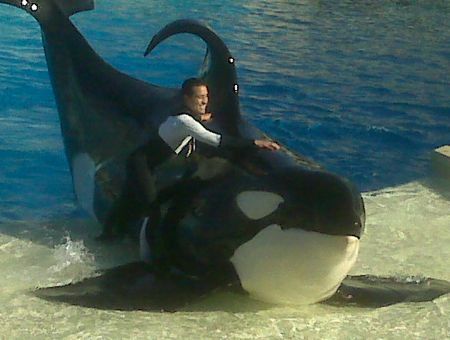 It’s either okay to train killer whales to be in shows or it’s not. If it’s okay, it’s because the whales like it, not because they have decided that it’s the right thing to do for the betterment of their kind. And if they like it, then there’s no reason not to have ’em jumping through hoops as red-white-and-blue fireworks go off with the song “Danger Zone” going on in the background. If the whales are 5% as sentient as Anheuser-Busch’s advertising firm wants you to think they are, the whales would probably *prefer* the Kenny Loggins version. I know I would have. Went to Sea World back in December. I’m now an annual member (because it cost the same as a day pass, that’s why)! The killer whale show is called “Believe!”. Right, so I *believed* in killer whales *before* even having to go to the show. May as well have encouraged folks to believe in lighthouses — they’re closer to extinction and at least *they* sort of do something good for people. My favorite line: “…and she honors us by allowing us to work with her children.” If it *isn’t* okay to train killer whales to take part in for-profit public spectacles, then pretending that they’ve given you permission to do so might not make it all right. Maybe we should pray to Shamu and see if she’ll honor us by verifying. To be fair, the show wasn’t *actually* about witnessing to the fact that killer whales exist — although the orca-as-God idea did seem to be its most forceful message. And it wasn’t like they were resorting to logic to explain their theme, which technically was about how if you dream of one day growing up to swim with killer whales, then it must happen! Such an insidiously Gen Y sentiment. Good luck, kids. There are only likely to be about 50 whale trainers in your entire generation and you probably won’t be one of them. Not even if you pray to Obama like a good little boy/girl. On the other hand, if only I had the faith of a whale-trainer, then the world would bow to my will! Ugh. Sea World. If I were a drinker, I’d boycott Anheuser-Busch. And their shadowy Belgian parent company. heh heh heh. Nice Brian. You make me laugh. More please….. But I’m *so tired*. Maybe five days in a row will happen. Maybe. Brian. I’m not sure if you had realized this or not,… But I have the faith of a whale trainer. Bow to my will! If we’re talking Top Gun songs, Cheap Trick’s “MIghty Wings” wins. What do you hava against being “honored” by a matriarch orca? If you punched a fish, and orcas eat fish, shouldn’t the “enemy of your enemy” be your friend? I once wrote a poem entitled “Ode to the Orca.” Don’t deny the deity thing. I have one quotation in each paragraph. Should’nt such “style” count for something in writing? Oh, and I actually “believed” for a few seconds when the fake tourist fell into the dolphin pool — that was fairly well staged. Mr. Jovanovich (with trademark fedora): Let’s make Seaworld a shining example of marine life exhibition. Mr. Scarpuzzi (head whale trainer): Sorry, no Candu. Also, my friend Paul had to retire as a whale trainer after a less published ramming/pinning incident. The early shows were more spectacle than worship. Still, the whales are far less threatening behind the 3 inch plexiglass than on the open sea in a kayak (as you well know). The tourist was fake? Times must be bad when you have to use a fake tourist. In retrospect, it should’ve been entitled “…Corporate Religion *Encounter*!”. My bad.